Hello Friedns, as in continuation to involve Subject Matter Experts to improve and get to knowledge, here today we showcasing Mr Raju Ghosal, An Oracle Applications DBA, experts in his area. I encourage you all to ask ur query/ question to him. Ans: Currently working with a Multinational in Developing strategic projects deployment plans; analyzing and coordinating ERP business applications across all phases of an entire Software Application Life Cycle (SALC). I was involved in through out implementation of E-Business Financials module in my earlier assignment which includes interfaces of legacy data, GAP analysis, customization of FORMS, Reports and Maintaining 5 instances with scheduled refreshes, up to date patching etc. I was also a part of management advisory board for all BCP activities. 2. Please share some/ any of your Oracle work related professional /project experience. Ans: I was involved in through out implementation of E-Business Financials module in my earlier assignment which includes interfaces of legacy data, GAP analysis, customization of FORMS, Reports and Maintaining 5 instances with scheduled refreshes, up to date patching etc. Instance Management – Work with DBAs, SA’s and CT Application Teams in coordinating instance refreshes, downtimes, usage for initiatives. Oracle Patch Management – Coordinating with Functional teams /DBA Teams /Prod Support teams/Oracle Teams, etc on Patches/SRs for Oracle Application Instances. Coordinating Finance Technology Environment Initiatives – examples: 10G Upgrades, Partitioning, etc with DBAs, Functional Teams, App Leads and Prod Support. Status Reports – Produce various surveys, reports, logs, etc pertaining to Technology Initiatives, issues and standard operations. Conducting Business Continuity Planning initiatives which includes Crash and Recovery test and High Availability Test etc. 4. You take lot of interview, what are the common professional skills you look in candidates, how you advise candidates to focus on to improve their interview performance. Should be confident of what he is speaking. Should have sound knowledge on the business impact of the task he is doing or has done. He/She should understand the business logic involved or the process flow of the application he is working on. He/She should have excellent attitude towards work and always willing to learn. 5. How you differentiate between Support, Development, Implementation and other different kind of activities as part of team scope and work. How they different and how a professional should identify his role and relevance. What are skills require for different kind of activities. Ans: Implementation is the whole of processes that defines a complete method to implement software in an organization. It is based on best practices and case studies from various literature sources and presents a collection of processes and products that make up a complete implementation method to allow any organization to plan and execute the implementation of ERP software. Developer Role is to prepare the Technical Specification (based on a Functional Specification given by a Functional Consultant), build the code, Review the code and finally to prepare the Unit Test Cases. Sometimes the developer may be asked to do a technical research for an optimal solution. After a go live, the application needs a maintenance/support to resolve the issues/tickets raised by the users when using the application. Ticket is like a request for changes/bug fixing or a request for a new Developer Role includes bug fixing/change the existing code due to new requirements/build a new code etc. 6. Need your view on terms Functional, Technical and Techno-Functional. How you think these have relevance. Do techno-functional professional real advantageous or it is kind of overlapping. Ans: Techno Functional professionals has always the advantage over Functional or Technical guys specially in cracking the Interviews as they are very good to map the Business needs with the jobs they are doing moreover they are in very high demands among Multinationals where you need to gel well with the actual business users. To my understanding a professionals should be well versed with the business needs along with the technical jobs they are expected to perform. This gives a win-win feeling to both the Business needs and the technologies as a whole. Ans: Good going…I wish all the best for future Endeavour. Ans: You should publish few DBA related articles which are in high demands in current market scenarios. Disclaimer: Opinions expressed by the OCP Advisor is entirely his own and do not reflect the position of Oracle or any other corporation. 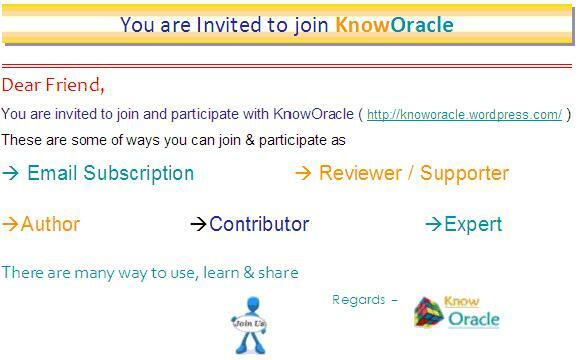 Any advice or recommendations discussed are not validated by Oracle.